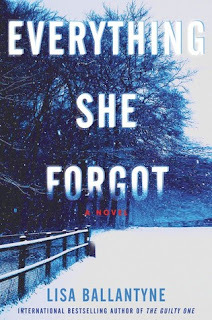 Everything She Forgot by Lisa Ballantyne is a highly recommended character study of love and redemption set in two time periods. In 2013 Margaret Holloway is driving home on icy, snowy roads when she finds herself in a huge multi-car pile-up. Margaret is stuck in her car and unable to get out. When she smells gas and realizes her car is on fire, Margaret is sure she is going to die. Then, out of nowhere, a man comes and tries to help her escape. He hurts his hand when breaking her window, but manages to get her out of the car. Then he seemingly disappears in the melee surrounding the huge accident. After the accident, Margaret finds herself unable to concentrate. She is having flashbacks to the crash and strangely remembering things from her childhood that she thought she had forgotten, or repressed. She also finds herself drawn to find and sit in the hospital at the bedside of the man who saved her. She learns his name is Maxwell Brown and that he's had no other visitors. Alternating chapters are set in 1982. Big George McLaughlin was born into a family of gangsters but he just wants to get back together with his first girlfriend and help raise his daughter, Molly, away from his family. When he meets Molly, now age 7, on her way to school, he ends up unwittingly abducting her. We also learn of George's childhood. While the two are on the run and bonding, a strange reporter named Angus Campbell is trying to figure out who abducted Molly and make a name for himself. The present day story is told through Margaret's point of view, while the story set in 1985 is told through multiple points of view, although mainly through George and Angus. I was looking forward to reading Everything She Forgot after reading The Guilty One and I wasn't disappointed. Although it is being described as a mystery, it is really more of a character study. While there is a mystery, much of it will be easily discerned early on by most readers. There are several surprises, though, that you won't figure out beforehand. What will compel you to keep reading is the quality of the writing, the answers to a few nagging questions, and the emotional connection you will feel for Margaret and George. I enjoyed this one as well! It wasn't always an easy read for me but it was definitely worth it. I can't wait to read more by this author. Glad you enjoyed this one as well!